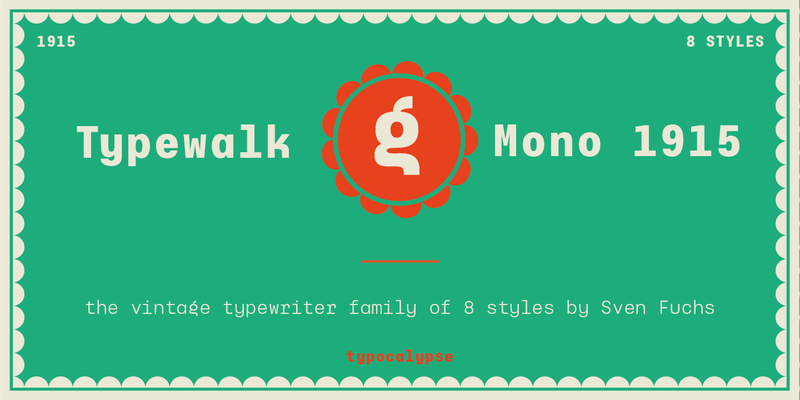 »Typewalk Mono 1915« the vintage typewriter grotesque that is branded by history. It is a tribute to the European sign painter and lettering tradition of the early 20th century. »Typewalk Mono 1915« also speaks in the proto-rational and graphical language of the »Werkbund Objectivity« which was used around 1915. It works great for cultural, editorial and branding purposes. It is versatile in small printing sizes and works great on the web. Speaking with its unique voice. »Typewalk Mono 1915« is the debut release by Sven Fuchs and was designed between 2012 and 2016. It has 8 distinctive weights from thin to bold. Check out the proportional version »Typewalk 1915«. Sven Fuchs co-founded Typocalypse — a typographic collective and typefoundry — together with Kai Merker and Stefan Hübsch back in 2008. As a designer, he focuses on type, typography and code. He frequently holds workshops and is a lecturer at the Saar College of Fine Arts and Trier University of Applied Sciences. Free for non-commercial usage only! For single weights or webfonts feel free to contact us.